The Participative Ranking Methodology (PRM) is a ‘mixed methods’ approach to data collection, in which a group of knowledgeable participants are guided in generating responses to a specific question or set of questions. The PRM draws on both quantitative and qualitative methodologies to generate rich, contextualized data that can nonetheless be counted, ranked, and compared across or within groups. This methodology promotes an engaged and participatory process, which rapidly highlights key findings while providing the opportunity for deeper analysis as resources permit. 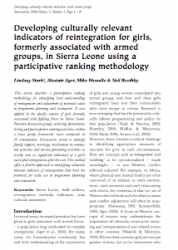 Uses of the PRM include the development of culturally relevant indicators of reintegration for girls formerly associated with armed groups in Sierra Leone and the determination of community-level child protection concerns during national child protection systems mappings in West Africa. 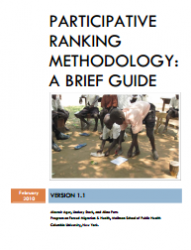 This is a practical guide to the Participatory Ranking Methodology (PRM). PRM is a ‘mixed methods’ approach to data collection, in which a group of knowledgeable participants are guided in generating responses to a specific question or set of questions. 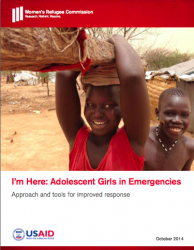 This report from the Women's Refugee Commission outlines an operational approach and recommendations that can help humanitarian sectors be more accountable to adolescent girls from the start of an emergency.